The basic transport nearly every urban house-hold in India use is a two-wheeler. On an average an Indian travels 300 KMs a month in his/her motor-bike(In cities people travel even more), which costs more than 400 Rupees per month. If they commute daily in electric bike, they can save at least a 50% (including the battery replacement cost) of what they spend on petrol-vehicle which amounts to a saving of Rs. 200 to 400 a month based on the distance they travel. This is the direct benefit. There are also lot of indirect benefits to the society. Saving of foreign exchange worth close to 1 Billion $ (approximate) by reducing the oil imports (There are approximately around 75 Million motor-bikes in India). Replacing all two wheelers in a year is impractical, this benefit is gradual over a period of 10 or more years. Unlike electric-cars the electric-bike’s battery, which is of smaller capacity can be charged with solar charger. So there is a potential of electric power saving. The electric bike when parked at home with fully charged battery could become an inverter/UPS when power failed at home. The lesser pollution surely benefit the environment. Domestic electric and electronic companies gets benefited from local design and manufacturing what is called as ESDM (Electronics System Design and Manufacturing). Nobody need to force to use electric bikes, if the good quality bikes available at same price of gasoline bikes atleast cost-conscious people will buy the bijlee bike. 2. Coimbatore based Ampere Vehicles has a broad range of models such as Abhi, Adya, Angel, Aditi, Bobo Retro, Buddy, Pearl, Prince, Trishul, V60, Visva DD and Zeal. This include simple bicycle like electric-vehicles to scooters. 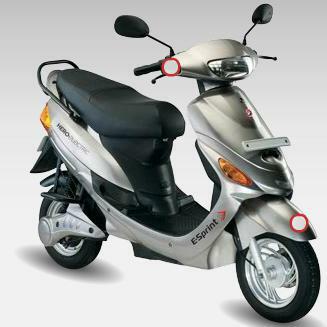 So it is hard to find any reason why Government should not support electric two-wheeler industry. Government can extend whatever the support it is giving to four-wheeler electric cars to bikes too, including charging station. Electric bikes and cars can use the same charging station.